The United Arab Emirates' main parliamentary body, the Federal National Council or FNC, meets regularly in the Zayed Grand Hall in the city of Abu Dhabi, to debate everything from economics to women's rights. In order to facilitate their sessions and keep pace technologically, the FNC hired Abu Dhabi-based systems integrator Business Link Electronics to install a new AV system in the hall, using Extron MTP signal distribution technologies and TouchLink™ touchpanel control. The large hall contains 76 tables for members, each with a PC, keyboard, and monitor. The FNC wanted the ability to select signals from satellite, cable, broadcast cameras, DVD, outside broadcasting vans, and PCs, as well as from the control desk, minister's desk, delegate's desk, and podium for display on members' PCs and a 65-inch (165 cm) LCD display at the front of the hall. The integrator, Business Link Electronics, decided to use CAT 5-type cabling with Extron twisted pair transmitters and receivers, as well as Extron switchers and distribution amplifiers. “Given the distances involved and the complex signal paths, we knew Extron twisted pair technology was the best solution," says Business Link Electronics General Manager Mohammad Jassim. The system was designed around an Extron IN1508 Eight Input Scaling Presentation Switcher with PIP, which acts as a signal gatekeeper; processing and distributing all incoming AV signals. The IN1508 optimizes incoming standard definition and computer-video to a single 1024x768 output resolution. The IN1508 features seamless switching to select the specific content that all members can view simultaneously without any distracting visual jumps, glitches, or distortion. Signals from each source travel either directly to the IN1508 or through Extron signal processing and distribution equipment, such as MDA Series video distribution amplifiers and MTP Series twisted pair extenders and switchers. 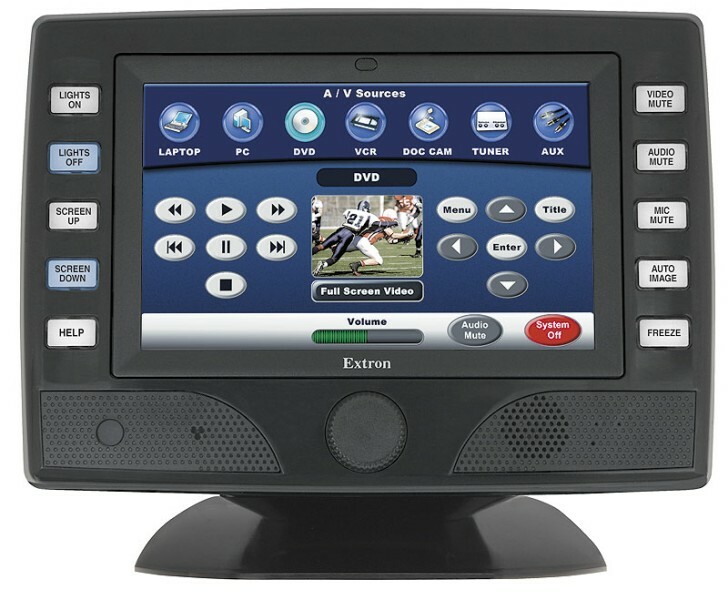 Signals that are meant to be displayed as multiple images are routed through an Extron MGP 464 Multi Graphic Processor. The media staff created various layout presets for the MGP 464, which can be recalled by the system operator, using the control system. In order to send signals from the AV control room to 80 separate displays, over long distances and complex cabling paths, Business Link Electronics used MTP Series twisted pair transmitters and a cascade of MTP DA4 and MTP DA8 distribution amplifiers. Signals arrive at the tables closest to the AV control room via Extron VTR001 receivers. Tables further from the control room use longerrange MTP RL 15HD A receivers. A simple contact closure switch at each table enables members to toggle between the incoming signal and their local PC via an Extron VSW 2VGA A Two Input VGA and Stereo Audio Switcher. Control of the system is assigned to a media supervisor and occasionally to other staff members. To facilitate their work, Business Link Electronics used Extron's TLP 700TV 7" TouchLink tabletop touchpanel, paired with an IPL 250 Ethernet control processor, which together control all AV sources, projectors and screens, a Panasonic broadcast camera switcher, the MGP 464, and the IN1508. “TouchLink gives us complete control of a very sophisticated AV system, and makes it easy for our members to use," states Jassim. The result is a sophisticated but user-friendly AV system, installed on time and within budget, allowing FNC members to communicate more effectively on crucial matters of government. The TLP 700 TV controls the entire AV system.